2018 has been an incredibly busy year for us. Which is why we’ve been looking forward to the Summer, as it’s normally a bit quieter. But not this year … we’ve been flat out! So, here’s a brief round-up of what we’ve been up to lately. After 4 and half wonderful years at the Creative Exchange Leith we said Goodbye to our friends and collaborators in December 2017. 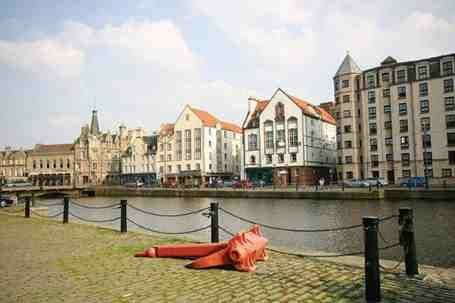 We moved into the Creative Exchange Leith in the Summer of 2013. Being one of the first companies in, we got to see the place grow and evolve from the beginning. Making the move to the Creative Exchange was a great decision for us. As it was exactly what we needed at the time. We got to work in a beautiful yet affordable work-space. But most importantly we got to meet, learn from and collaborate with people we may never have met otherwise. So, many thanks to everyone who made the Creative Exchange Leith what it was, a truly brilliant place to work. But most importantly thanks to Jim Galloway and everyone on the Economic Development team! They translated an idea into something that countless companies and freelancers we’re able to benefit from. So thank you for setting up and persevering with the Creative Exchange. We’re so glad we were able to contribute and benefit from such a unique opportunity! Before we decided to leave the Creative Exchange Leith, we drew up a list of requirements that our new office needed to meet. A meeting room/workshop space for 10-20 people. Given how many properties we saw, we now appreciate just how lucky we are to have found Waterside House. Based on The Shore, we’re just around the corner from our old office and all of our local favourites. But most importantly it’s an absolutely brilliant working environment. The concept of trying to create different spaces has really worked. And for once we actually have a surplus of desks, whiteboards and wall space. Which has improved our productivity and proved invaluable when working on multiple projects at the same time. If you’d like to learn more about our new space and facilities do get in touch or stop by for a coffee and a chat. This was a truly amazing experience. With over 100 participants collaborating to build Project Barnacle, a truly innovative product and digital service. Check out Esther’s post, on the process and what made this such an incredibly special design sprint: Serendipity of the Water Gods. NHS 24 asked us to design and facilitate another series of collaborative design workshops. These were focused on evaluating a key touch point and defining its future vision, mission and measurements of success. The result, a revised brand and product strategy that clearly synthesises all of the inputs captured throughout the project. The National Galleries of Scotland engaged us to support their in-house team and external development partner improve their existing website. This long-term project has allowed us to assist departments across the business define and visualise their requirements. Additionally, the National Galleries of Scotland engaged us to conduct a cross-channel content review. The purpose of this project was to review the content they produced across channels. Given the volume and diversity of content they produce this was no small undertaking. And we can’t wait to see the outputs of this inform a revised content and publishing strategy. Lothian Buses asked us to assist their in-house team evaluate their old website and identify how this might be improved. This involved an expert review, on-street interviews and on-going support at each key stage of the design and development process. Now that the website has gone live we are supporting the team extend and improve it. The Scottish Government and NHS 24 asked us to archive the Know Who To Turn To website prior to it being decommissioned. This was a key project for us. As when it was launched in 2014 it was the first NHS Scotland touch point that provided localised health information across health boards and most importantly devices. This mobile-first proof of concept exceeded expectations and contributed to the development of the National Services Health Directory. So, it’s sad to see this website go, but looking back on it, it truly was one of our most successful projects. We have continued to collaborate with Digital Boutique on an incredibly broad range of highly prestigious projects. Craft Design House engaged us to assist their in-house team extend their service offering. We’ve also helped a number of different companies evaluate how they’ve responded to GDPR from an end-users’ perspective. And last, but certainly not least, we were delighted to support the Turing Trust plan, develop and launch the new website. We can’t wait to see how the new website’s content and structure performs. Over the coming weeks we’ll be kicking off a new project for a new client that we’re delighted to be working with. We’ll let you know more about this, and all of the other projects we’ll be working on, over the coming weeks. Esther presented two jam-packed breakout sessions, UX Design – key to success or just fluff, at Digital Transformation 2018. Build a framework for success. The feedback from this talk was absolutely brilliant – so check out the slides on Slideshare. In April, Esther and I travelled over to CodeBase Stirling to present an Introduction to User Experience to the local Girl Geeks group. Presenting these back to the group for feedback. This was a brilliant experience. It forced us to simplify everything and really focus on familiarising the girls with techniques they could adapt and use in the future. The volume of ideas generated was immense and the best bit was seeing everyone present not just what they’d sketched but the thinking behind it! So many thanks to CodeBase Stirling for the opportunity – we had a blast and really hope all the participants did too!!! After starting out as an intern, Luke had been with us for almost 2 years. So, it was a real shame to hear he was moving back to Dundee. We wish him all the best in his new role and would like to thank him for all he did for us and our clients whilst he was here! On the flip side though … after having left the Royal Bank of Scotland, we’re delighted that Bill Douglas will be spending more time at Border Crossing UX. We value and leverage Bill’s experience all of the time. Which is why we’re delighted he’ll be getting more involved in the day-to-day and client-side consulting. If you’re interested in learning more about joining our team don’t wait for the ads to go live – get in touch today. With our financial end of year in sight, we’re already looking forward to the next one! As even though this year has been busy – it’s also been incredibly rewarding. Which is why we’re so keen to do everything possible to make sure next year is even more successful than this one. If you’d like to learn more about Border Crossing UX, what we’ve been up to or what we hope to achieve in the future please get in touch on 0131 467 9227.